The Nadahama Bridge is the longest V-legged steel girder bridge in the world. It has three spans with a main span length of 160 m. and a total length of 400m. It was completed in 1993. The Y-shaped legs are supported by steel pipe piles filled with concrete. 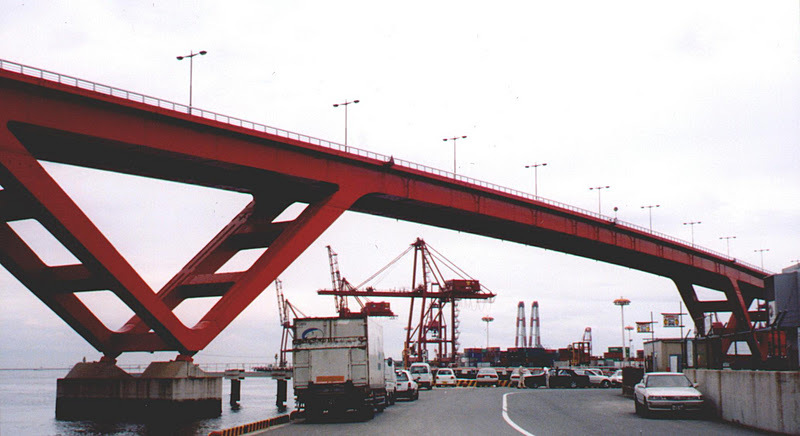 These piles were deep enough and strong enough to resisted lateral spreading of the surrounding soil during the 1995 Kobe Earthquake and the bridge remained in service following the earthquake. Osaka Bay Bridges: Nadahama Bridge by Mark Yashinsky is licensed under a Creative Commons Attribution-NonCommercial-ShareAlike 3.0 United States License.